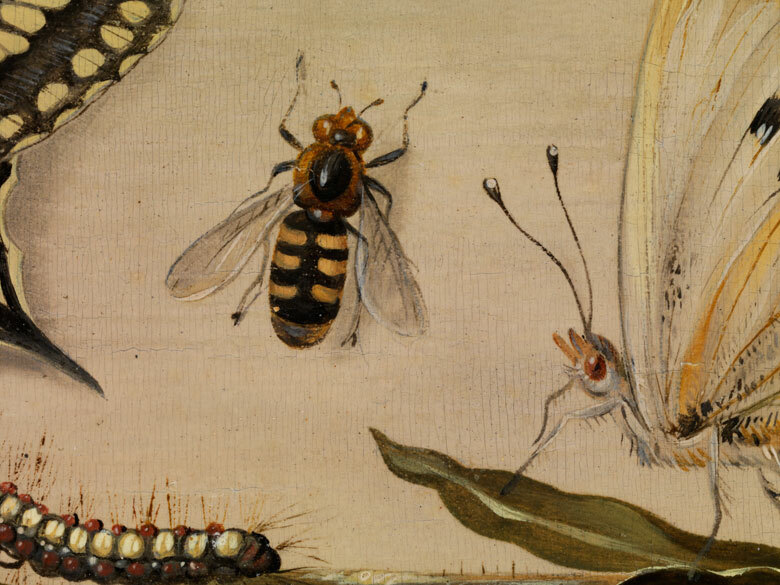 Gemäldepaar STILLLEBEN MIT INSEKTEN UND AKELEI sowie STILLLEBEN MIT INSEKTEN UND VERGISSMEINNICHT Öl auf Eichentafel. Beide Gemälde am Unterrand mittig signiert „J.v. 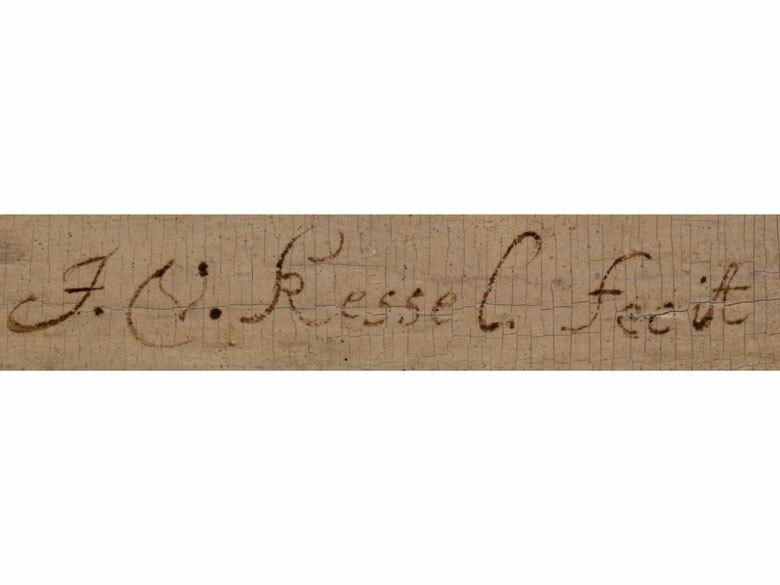 Kessel fecit“. Zu jedem Einzelbild ein Gutachten von Dr. Klaus Ertz, Lingen, 25. August 2015, beigegeben sowie eine Pigmentanalyse von Prof. Dr. Manfred Schreiner, Wien, August 2015. Both oil on small oak panel. Both paintings signed “J.v. Kessel fecit” on the lower edge at centre. These two cabinet pieces of museum-quality have the same dimensions and uniform colouration with flower stalks, butterflies and insects arranged on a beige ground. Probably created as counterparts, the aquilegia stalks are depicted diagonally to the right, while the forget-me-not stalks and flowers are arranged to the left. 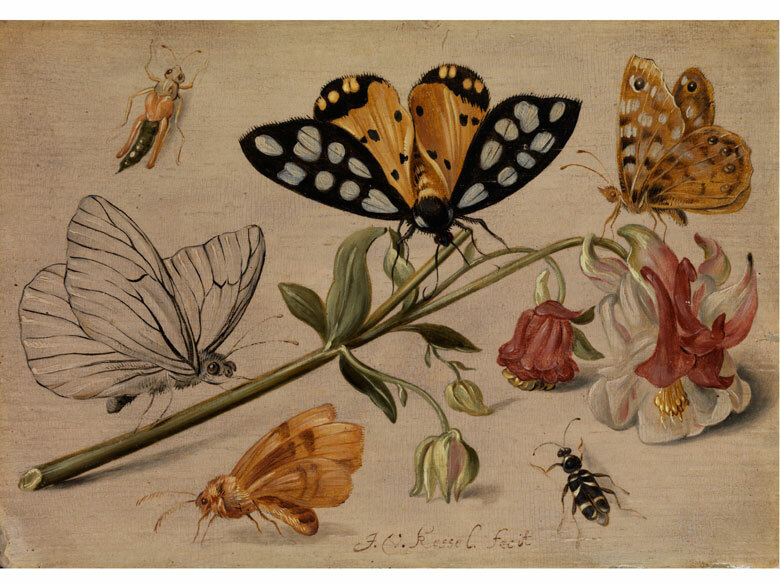 The aquilegia with its white and pale pink flowers is depicted with a small butterfly. 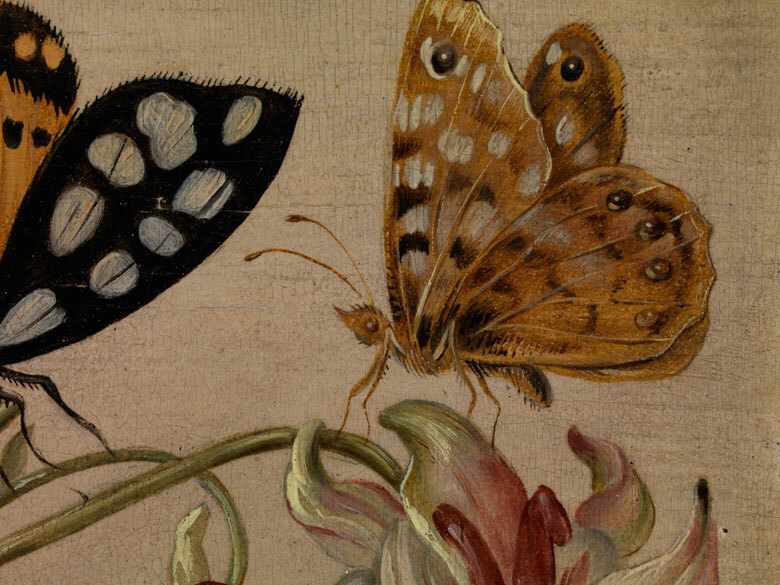 At the centre, another, larger butterfly is depicted standing on the petals, he is more dominant in colour with black wings and light-grey and brown-golden yellow colouration. 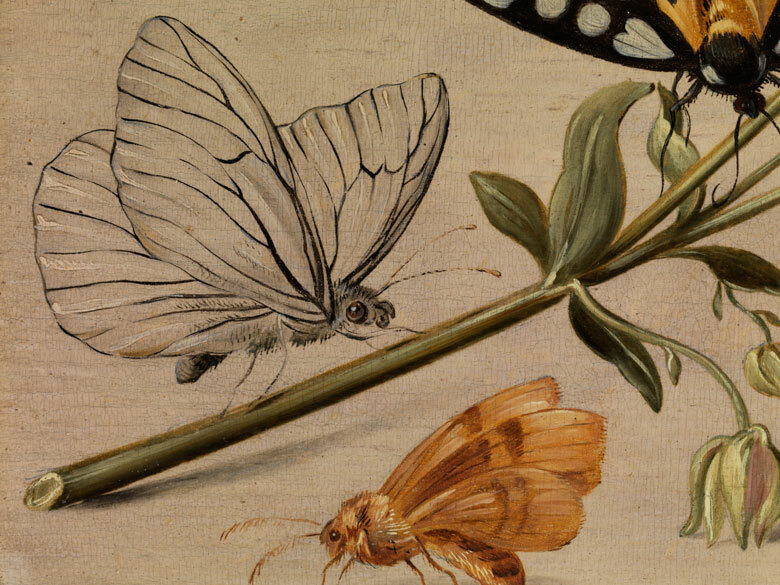 On the left, another butterfly can be seen with white, dark-veined wings and a moth is shown below it. 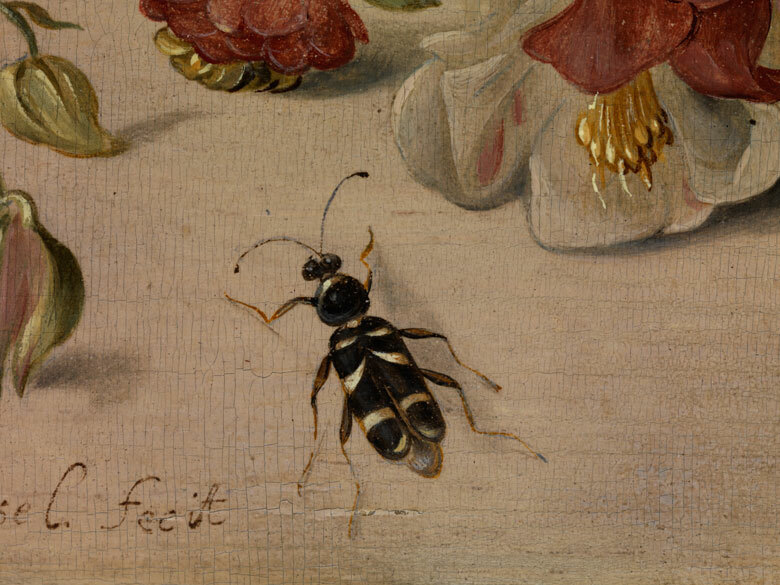 The free areas in between are decorated with two ground beetles. 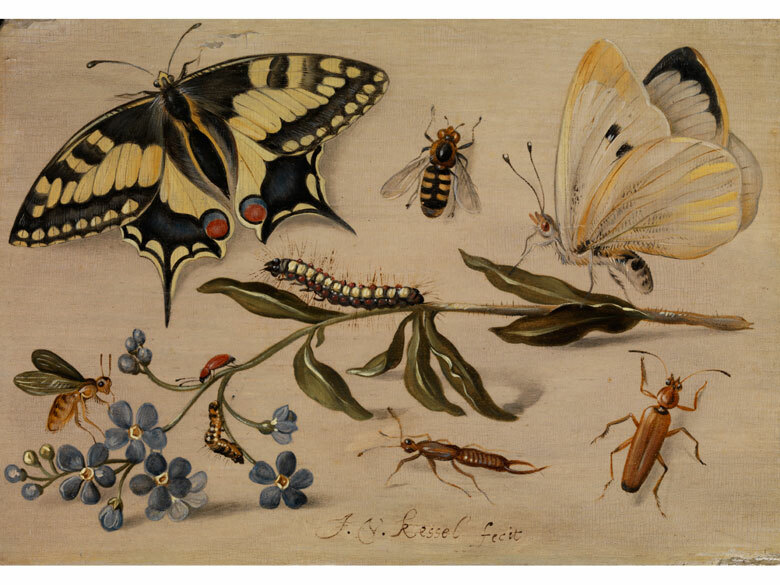 The counterpart painting shows a caterpillar on the stalk, a cabbage white butterfly further to the right and, here too, a larger Admiral butterfly dominates the scene. 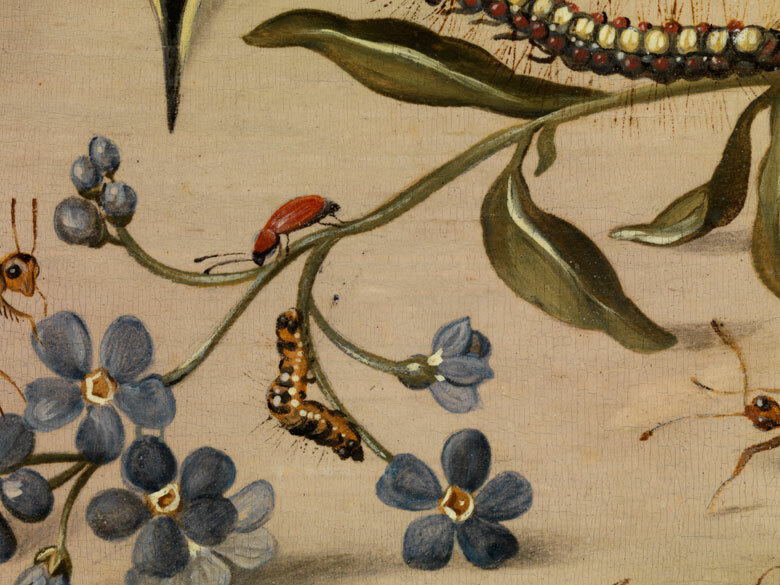 Again, the spaces inbetween are filled with bees, ground beetles, earwigs and a small caterpillar. In pristine condition. 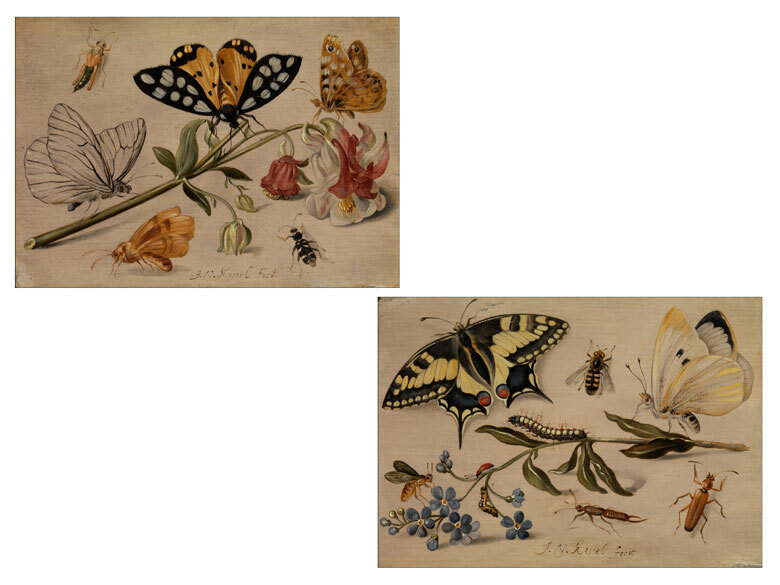 For each of the paintings a report by Klaus Ertz, Singen, 25 August 2015 is enclosed as well as a pigment analysis by Prof. Dr. Manfred Schreiner, Vienna.